Live Oak Community Health Center - ATASCOSA HEALTH CENTER, INC. 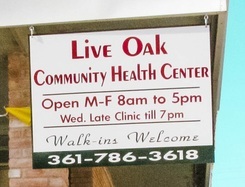 The Live Oak Community Health Center is a satellite clinic of the Atascosa Community Health Center, Inc. Opened in October, 2012, LOCHC is conveniently located and serves the residents of Live Oak County. Our providers and staff are knowledgeable of community resources and make referrals when necessary. We work hard to provide all of our patients with the care they require in a comfortable environment.